The early flowering Iris reticulata are a group of dwarf iris varieties that are particularly attractive. A number of varieties with differing flower colours are available for sale online. For us early flowering means a few weeks after the winter solstice, a sign that the seasons are on the turn. Easy to grow and excellent in the ground as well as in containers they make a bright display at this time of the year. A mass planting in a wide container or pot will give a stunning display in spring. These are a bulb rather then a rhizome and vary in color from white through to reds and purples. 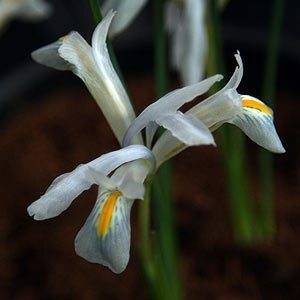 They require different conditions to some other iris but are a hardy bulb. Although some species are available for sale it is the cultivars such as ‘Lady Beatrice Stanley’ with its classical blue flower with flecked falls. ‘J S Dijt’ with its purple and yellow flowers and ‘Alida’ which is another with pale blue fl owers are all worth seeking out. Well suited to the Australian climate as they do like a dry summer these bulbs also need to be planted fairly deep. Full sun in winter and a humus rich soil. 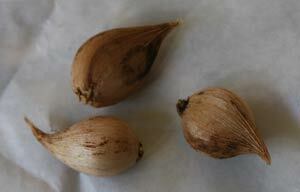 Plant bulbs at around 15cm deep either in the ground or in a container. They do like a soil that is leaning towards the alkaline side so many gardeners add some lime to lower ph. Bulbs will naturally multiply and can eventually be divided. Many of these hybrid varieties will seem to stop flowering after a few years, this is because the bulbs have divided and the smaller offsets will take a year or so to get to flowering size. It is important to let the foliage die back naturally as this allows the bulbs to regain energy for the next season. Divide and replant in a newly prepared soil and the bulbs will flower for you again in a year. Flower colour – Pale blue to Purple with white and or yellow makings depending on variety. Iris reticulata bulbs are available for sale online from the following participating nurseries.